Student Center Lot from Tenth St. Turn into campus on Hemphill Avenue. At the fork, bear right onto Ferst Drive and continue to the visitor lot adjacent to the Student Center. Burge Deck from North Ave. The Burge Deck is located directly on North Avenue across the street from the courtyard adjacent to the stadium. Burge Deck from Tenth St. Turn into campus on Fowler Street. Turn left onto Fifth Street and then right onto Techwood Drive. At the intersection of Techwood Drive and North Avenue, turn right and the deck will be approximately one block on the left. State Street Lot from North Ave. Turn into campus on Techwood Drive. Turn left onto Fifth Street . At the intersection with Fowler Street, Fifth Street becomes Ferst Drive. Continue down Ferst Drive, and the State Street lot will be on the left. State Street Lot from Tenth St. Turn into campus on Hemphill Avenue. At the fork in the road, turn left onto Ferst Drive. The lot will be on the right. The fee for all lots is $0.50 per half hour with a $8 maximum. Metered parking is enforced from 8 A.M. to 5 P.M. Monday - Friday in the academic areas and 24 hours per day, seven days per week in the residential areas. The fee is $1 per hour with a 2 hour maximum. 10 hour max in Burge deck. Visit Parking and Transportation at Georgia Tech for additional information, or call (404) 894-9645. Due to the shortage of parking on campus, visitors to EAS are strongly encouraged to use public transportation if possible. From Hartsfield-Jackson International Airport, board any MARTA train and exit at either the North Avenue or Midtown Station. You do not need to change trains. 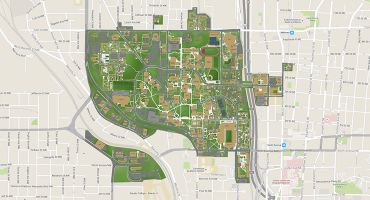 The North Avenue and Midtown MARTA stations are approximately a 20-30 minute walk from the Environmental Science and Technology Building (ES&T). If you would like to walk, exit the North Avenue MARTA station on North Avenue and walk west, across the Downtown Connector (Interstates 75/85) overpass. After crossing the interstate, turn right on Techwood Drive, beside the Georgia Tech stadium. Walk north to Ferst Drive (the first light after Fourth Street). Turn left on Ferst Drive and walk past the Russ Chandler Stadium and Cherry Street. ES&T is on the right. Enter on the west (left) side of the building. Once in the atrium, turn right and go down the hall, through the double doors to Room 1176. If you prefer to ride, Monday through Friday from 5:45 AM until 11:00 PM and on Saturdays from 10 AM until 6 PM, as well as Sundays from 3:00 PM until 11:00 PM, Georgia Tech operates a free trolley and shuttle (Stinger) service (the schedule will vary depending on whether classes are in session). The Tech Trolley leaves every 10-15 minutes from the Midtown MARTA station (West Peachtree Street side) and passes down Ferst Drive. Disembark at the Atlantic Avenue stop, cross the street (on the same side as stop), and ES&T is next door to the Petit Building which is on the corner. The Tech Stinger Shuttle service includes two circulator routes going in opposite directions moving around the perimeter of the campus and along Ferst Drive. Please note, service is available Monday through Friday, from 7:05 AM until 12:18 AM, and will vary depending on whether classes are in session. There is no service while Georgia Tech is closed. The Stinger Red Route runs Monday through Friday from 7:05 AM until 12:18 AM. The route is generally a loop around the heart of campus along Ferst Drive. The loop extends to the east along Techwood drive, North Avenue to the south, and McMillian Street to the west. The Stinger Blue Route runs Monday through Friday from 7:00 AM until 12:15 AM. The route is similar to the Red Route - generally a loop around the heart of campus, along Ferst Drive. The loop extends to the east along Techwood drive. 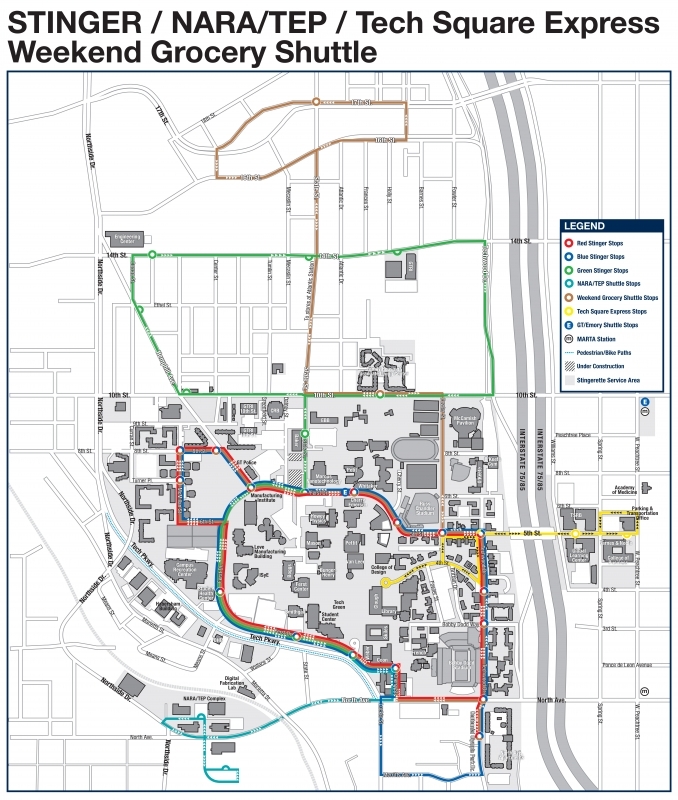 On the south/southwest side of campus, the Blue Route travels North Avenue, and then extends to include Techwood Parkway. The route includes McMillian Street to the west. The Stinger Green Route runs Monday through Friday from 7:15 AM to 5:45 PM and services locations extending North and South of Tech campus. To the north, the Green Route follows a smaller loop bordered by State Street to the west, 14th Street to the north, Techwood drive to the east and 10th Street to the south. The route extends south through State Street and Ferst Drive, and includes Techwood Parkway to the south of campus. For more information on the Stinger routes, please visit Parking and Transportation.